Highlights of all 16 games from the final round of NFL regular season matches. The Buffalo Bills defeated the Miami Dolphins 22-16 at Hard Rock Stadium in Florida on Sunday and then got the help they needed to reach the playoffs for the first time since 1999. Prior to Sunday, Buffalo had the longest active playoff drought in all four major North American team sports. But the Bills (9-7) suffered a key injury in the third quarter when six-time Pro-Bowl running back LeSean McCoy left the game in the third quarter due to an injury to his right ankle. He did not return. Andy Dalton threw three touchdown passes, including a 49-yard strike to Tyler Boyd with 44 seconds left, and the Cincinnati Bengals knocked the Baltimore Ravens out of the playoffs with a 31-27 victory. The Ravens took their first lead, 27-24, on a 6-yard touchdown pass from Joe Flacco to Mike Wallace with 8:48 left in the game. However, Dalton answered with a 90-yard drive to reclaim the lead. The Ravens (9-7) have now missed the playoffs for the third consecutive year. It was an emotional win for the Bengals (6-10) and head coach Marvin Lewis, who might not return after 15 seasons. The Atlanta Falcons are heading back to the playoffs thanks to five second-half field goals by Matt Bryant. Bryant, a 16-year veteran, included a 56-yarder among his kicks and the Falcons made life miserable for Carolina Panthers quarterback Cam Newton in a 22-10 victory. The Falcons (10-6) claimed the second wild-card berth in the NFC with the victory, while the Panthers (11-5) had to settle for the first wild-card spot rather than the NFC South title. Carolina finished in a tie with New Orleans, but the Saints beat the Panthers twice during the season to earn the division title and home field in the first round. Tampa Bay Buccaneers quarterback Jameis Winston tossed a 39-yard touchdown pass to rookie wide receiver Chris Godwin with nine seconds remaining -- capping a desperation 95-yard drive with no timeouts -- to produce a 31-24 victory over New Orleans at Raymond James Stadium. Despite the loss, the Saints backed into the franchise's first NFC South division title since 2011 because the Carolina Panthers were beaten by the Atlanta Falcons. The New England Patriots locked up the No. 1 seed in the AFC and home-field advantage in the playoffs with a 26-6 victory over the New York Jets in arctic conditions at Gillette Stadium in Massachusetts. The AFC East champion Patriots wrapped up their regular season at 13-3 to secure the conference's top spot for a second consecutive season and the seventh time overall. Dion Lewis totaled 133 yards (93 rushing, 40 receiving) and scored two touchdowns while Tom Brady completed 18-of-37 passes for 190 yards and two touchdowns for the Patriots. New York (5-11) finished last in the AFC East for the second straight season and the third time in four years. Minnesota had a few flaws in their offense and special teams during a 23-10 win over the Chicago Bears, but the Vikings will have an extra week to work on them before opening the playoffs at home. The Vikings (13-3) clinched a first-round bye with the win over Chicago and may have spelled the end for Bears head coach John Fox, who is widely expected to be dismissed after his team finished 5-11. Minnesota's last bye in the first round came in the 2010 playoffs. 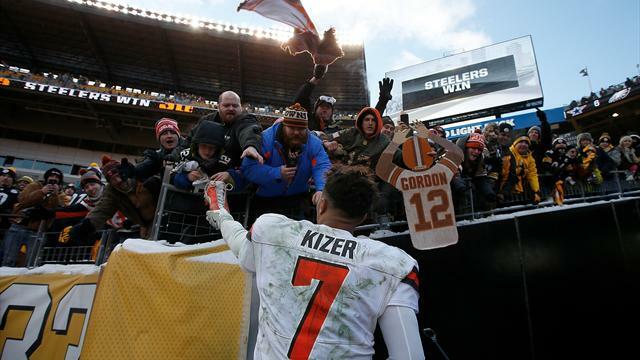 The Pittsburgh Steelers beat Cleveland 28-24 to make the Browns the second 0-16 team in NFL history. The 2008 Detroit Lions also went 0-16. The playoff-bound Steelers started Landry Jones at quarterback in place of Ben Roethlisberger and Jones completed 23-of-27 passes for 239 yards and a touchdown in guiding the Steelers to their 13th win of the season. Indianapolis running back Frank Gore rushed for 100 yards on 24 carries to help lead the Colts to a 22-13 victory over the Houston Texans at Lucas Oil Stadium. The Colts limited the Texans to 209 total yards and got a safety. Each AFC South team finished with a 4-12 record. Jacoby Brissett completed 15-of-24 passes for 114 yards and one touchdown for Indianapolis. Matthew Stafford threw three touchdown passes and also caught a two-point conversion as the Detroit Lions closed out their season with a 35-11 romp over the depleted Green Bay Packers at Ford Field. Kenny Golladay had a 54-yard touchdown catch for the Lions (9-7) in what may have been head coach Jim Caldwell's final game with the franchise. There has been heavy speculation that Caldwell will not be retained for a fifth season. Quarterback Dak Prescott threw a 12-yard touchdown pass to Brice Butler early in the fourth quarter and the Dallas Cowboys held on for a 6-0 victory over the Philadelphia Eagles at frigid Lincoln Financial Field. After last week's ineffective performance in a 19-10 win over the Oakland Raiders, Philadelphia coach Doug Pederson opted to bring back starter Nick Foles against the Cowboys. Foles didn't perform well once again, going 4 of 11 for 39 yards, one interception and a miniscule 9.3 quarterback rating. The Eagles had already clinched the NFC number one seed. The New York Giants scored two touchdowns in just over two minutes as they topped the Washington Redskins 18-10 at MetLife Stadium. New York quarterback Eli Manning made his 216th appearance, which ties Hall-of-Fame defensive end Michael Strahan's franchise record for the most games played in a Giants uniform. Philip Rivers threw for three touchdowns, Keenan Allen had a pair of scores and the Los Angeles Chargers completed their season sweep of the Oakland Raiders with a 30-10 win at the StubHub Center. Despite winning for the sixth time in seven games, the Chargers (9-7) didn't qualify for the postseason as an AFC wild-card team. Saddled by an 0-4 start, Los Angeles missed the playoffs for the seventh season in eight years. The Raiders (6-10) ended a disappointing season with their fourth straight loss as once again they struggled on offense. The San Francisco 49ers concluded the season with their fifth straight win, a 34-13 victory over the Los Angeles Rams at Los Angeles Memorial Coliseum. San Francisco quarterback Jimmy Garoppolo threw for 292 yards and two touchdowns along with two interceptions. San Francisco running back Carlos Hyde rushed for 90 yards and two scores. This time, the Tennessee Titans held on to the fourth quarter lead and clinched their first playoff spot since 2008. Three Ryan Succop field goals, a 66-yard touchdown reception by Derrick Henry and a relentless effort by the defense carried them to a 15-10 win over the AFC South champion Jacksonville Jaguars at Nissan Stadium. Tennessee (9-7) earned an AFC wild-card spot, while Jacksonville (10-6) lost its second straight game. But the outcome didn't affect its No. 3 seed for the playoffs. Seattle kicker Blair Walsh missed a 48-yard field-goal attempt with 32 seconds remaining, allowing the Arizona Cardinals to slip away with 26-24 win at CenturyLink Field. Rookie quarterback Patrick Mahomes led four scoring drives, the last leading to Harrison Butker's decisive field goal with no time left, and the playoff-bound Kansas City Chiefs rested key starters and pulled out a 27-24 victory over the Denver Broncos.